ZINC OXIDE (13.5%): Beyond its value for daytime UVA/UVB protection— Zinc Oxide is a calming and soothing ingredient for red irritated skin. Hence its use in baby balms. ERGOTHIONEINE (L): As an antioxidant, Ergothioneine protects skin from oxidative and DNA damage; protects the mitochondrial membrane against oxidation. PORPHYRA UMBILICALIS (RED ALGAE) EXTRACT: A unique organism, Red Algae produces the most powerful UV-absorbing substances in nature, and the extract itself absorbs UVA/UVB light. MALIC ACID (L): Derived from apples, Malic Acid smooths skin and promotes cellular renewal. Jackie, my daughter’s esthetician friend, gave me this for mother’s day. This is amazing! I am 62 years old, with eczemz, Rosacea, severe sun sensitivity, and allergic to many things in OTC preparations, and some Rx preparations. This sunscreen is not only moisturizing, it helps to eliminate the greasyness I have in the T zone, and it is gentle enough to use around my eyes. I no longer have to use my expensive Rx, as it does all! It reduces the redness, inflammation, moisturizes and protects form the sun. I love it! I cannot say enough good stuff about this lotion! I spent the past weekend in San Diego CA for my graduation from Ashford University. Hubby, our 19 yo son and I strolled the beach, board walk, and toured an aircraft carrier, essentially spending much time in the sun after spending the morning at the outside activities at the university. My son took a picture of me with the university president. When I got home Sunday night, I could not believe how good my skin looked, no flareups, no sunburn, and I actually looked younger! WOW! Thank you for this amazing product. As I do not go into the water, I had no need to re apply the sunscreen, and it worked all day with just the morning application! This is best sunscreen for sensitive skin! Just wanted to share with you the outcome of a client under my care, an 80 year-old man who has been using Hale & Hush products after experiencing some health challenges. I started him on the Quiet Wash, Soothe Essence Serum, Broad Spectrum SPF 30, and Vital Lipid Lotion. He had a squamous cell on his face and was being treated with a topical cream. When he started using the Soothe Essence Serum together with the Vital Lipid Lotion, the results were amazing. It healed faster and the oncologist was impressed. My client is also going through radiation therapy for a cancer near his jugular vein, and feels these products are helping him maintain the integrity of his skin. I am happy that he is experiencing wonderful results. Keep up the great work! Living in Arizona, I won’t leave the house without Broad Spectrum SPF 30 on my skin. After having skin cancer, I need special protection. This sunscreen has a cool, healing effect and is so emollient; I love how my skin feels after applying it. 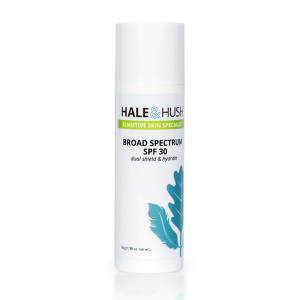 Thanks to Hale & Hush’s Broad Spectrum SPF 30, I can enjoy my convertible again!